The media took a dive into Wisconsin Republican Gov. Scott Walker’s college records this week in an attempt to solve the "lingering mystery" of why he chose to leave Marquette University. 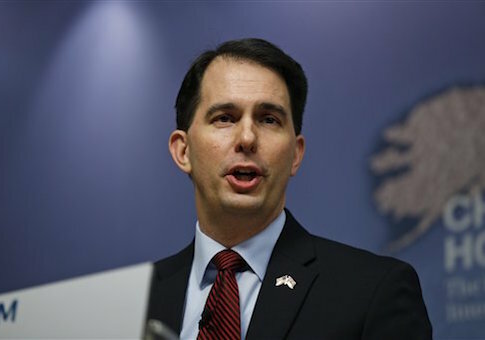 The scrutiny into Walker‘s education comes as he "mulls" a White House bid in 2016. It also comes just eight years after the media let then-presidential candidate Barack Obama slide on answering any questions about his own mysterious years at Columbia University. David Fahrenthold’s examination of Walker’s college years in the Washington Post spanned more than 2,000 words, and in the end, there is little mystery. Walker was an active member of the Marquette student body and has openly said that he decided to leave the university after being offered a full-time job during his senior year. The Walker probe delves into scandals such as his regular tardiness to French class and his reluctance to get into arguments with the liberals in his politics classes. The climax of the article comes with allegations that friends of Walker might have stolen copies of the school newspaper during his run for student body president. His roommate has since admitted that he took the newspapers and feels bad because he did it behind Walker’s back. For Obama, an in-depth investigation into his mysterious college years never came, as the Wall Street Journal noted less than a month before he was elected president in 2008. The Columbia years are a hole in the sprawling Obama hagiography. In his two published memoirs, the 47-year-old Democratic nominee barely mentions his experience there. He refuses to answer questions about Columbia and New York—which, in this media age, serves only to raise more of them. Why not release his Columbia transcript? Why has his senior essay gone missing? Unlike Walker, who was well known at Marquette and had a group of friends, Obama was a ghost at Columbia. More than 400 classmates of Obama were contacted during the 2008 election, and not one said they remembered him. The New York Sun described Columbia just before the 2008 election as a place Obama "rarely speaks about and where few people seem to remember him." The record on Obama’s Columbia years was sealed. Federal law limits the information that Columbia can release about Mr. Obama's time there. A spokesman for the university, Brian Connolly, confirmed that Mr. Obama spent two years at Columbia College and graduated in 1983 with a major in political science. He did not receive honors, Mr. Connolly said, though specific information on his grades is sealed. A program from the 1983 graduation ceremony lists him as a graduate. The media stood by as questions about Obama’s college years, a staple during the 2000 and 2004 elections, remained unanswered. The now-iconic pictures of Obama smoking as a college student were also kept under wraps until months after he was elected president. The pictures were hidden in a safety deposit box by a friend of Obama who didn't want him to be hurt politically. It wasn’t until the 2012 David Maraniss biography of Obama that a more complete story was published. Even after six years in the White House, Obama still has the benefit of a media that looks the other way to benefit him. It took six months for Gawker to break the news that campus radicals Bill Ayers and Bernardine Dohrn were with the Obama family at the August wedding of MSNBC anchor Alex Wagner and former White House chef Sam Kass, even though there was certainly a large media presence there as well. The Secret Service declined to answer questions about the wedding, according to Gawker. This entry was posted in Culture and tagged 2016 Election, Barack Obama, Media, Scott Walker. Bookmark the permalink.